I LOVE chocolate chip cookies. When it comes to desserts, it’s not necessary to make me a fancy trifle, pie, or cake. 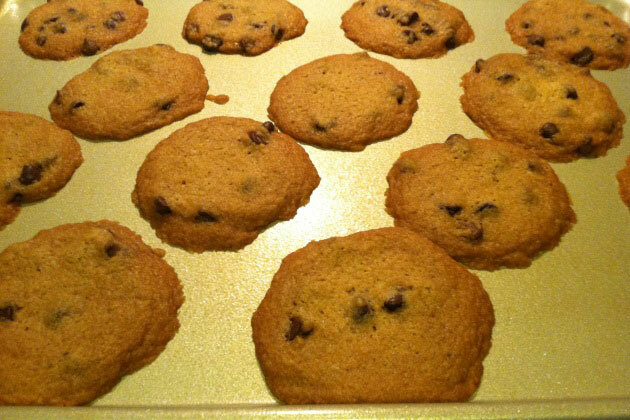 A simple, gooey, warm, yummy chocolate chip cookie is all it takes to satisfy my sweet tooth. That’s not to say that ALL chocolate chip cookies are created equal. 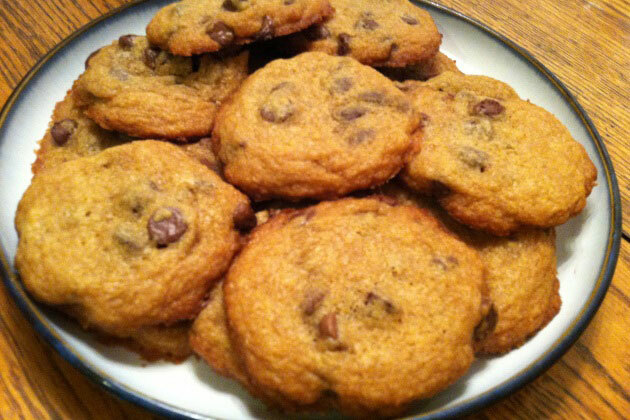 A yummy chocolate chip cookie is a homemade, right-out-of-the-oven chocolate chip cookie that has been made from scratch. While living the fit life, there are some things I am not willing to COMPLETELY give up. 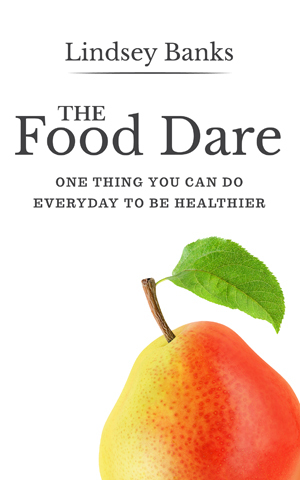 If you have not yet read my “food philosophy for a fit life” then check it out. 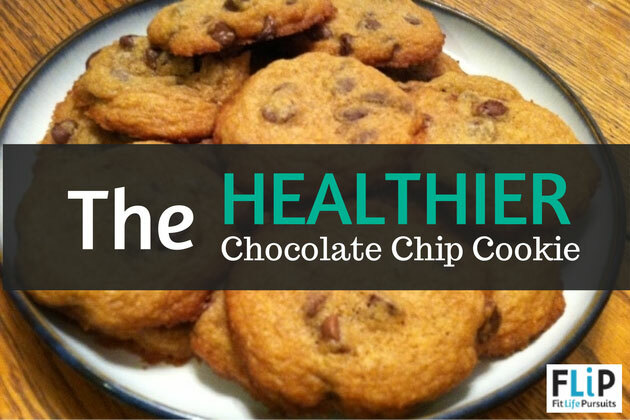 I have tried over a dozen different chocolate chip recipes to come up with a “healthier” version of the classic cookie that passes my yummy cookie test. While most yummy chocolate chip cookies are over 200 calories, my cookies are only 130 calories and are made with healthier ingredients. 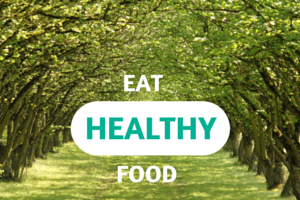 No butter, no eggs, no white sugar, and no vegetable oil that you will find in most chocolate chip cookie recipes. The secret recipes in these cookies is coconut oil and applesauce. Now you want cookies. Don’t you? Serve with an ice cold glass of 1% or 2% milk! 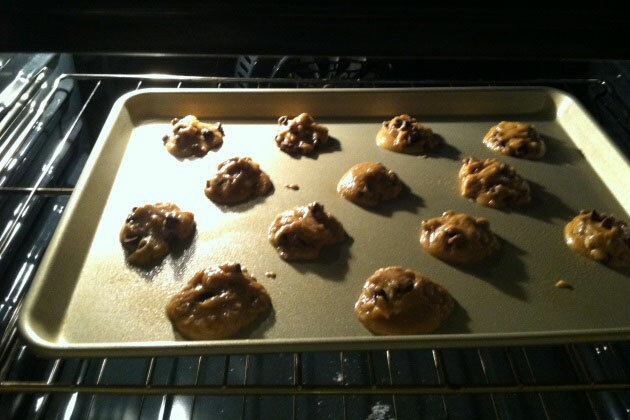 Preheat oven to 375 degrees F. Spray two cookie sheets with coconut oil spray (or other if unavailable). In a large bowl, use a mixer to combine coconut oil and brown sugar. Add in applesauce and vanilla extract and mix well. n another bowl, combine flour, salt, baking powder, and baking soda with whisk. Mix the flour mixture into the coconut oil mixture a little at a time until all the flour is incorporated. Drop by small spoonfuls onto prepared baking sheet. The recipe should make 28 cookies total, 14 on each baking sheet. Bake for 8-9 minutes or until slightly browned around the edges. (if your oven does not accommodate two baking sheets at once, keep the dough cooled in fridge before cooking the second sheet). They will be soft and chewy on the inside and a little crispy around the edges. Yummy!! Let them rest on the cookie sheet for 2 minutes before removing and eating! They are sooo good warm! Enjoy!